Friends when you are at that intersection, don’t feel that you need to rush to make a decision to go left or right. Instead, rush to your knees and seek the Lord in prayer. 1 Thessalonians 5:17 says “Pray without ceasing.” Ask for the knowledge, wisdom, and understanding from the Father and wait on him to answer you. Some people need to see things logically, or they need things to make sense, or be able to visualize all possible outcomes in order for them to make a decision. However NONE of us can predict the future. And NONE of us have all the answers. That being said, we need to have Faith! (…easier said than done right!?) Having Faith is believing in the things we cannot see. If we can see it we don’t have to have faith in it. 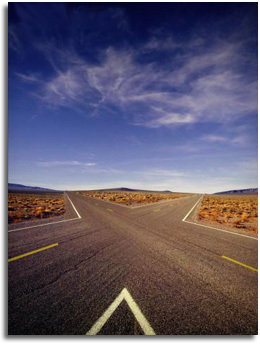 We don’t know what is going to happen if we decide to go left or right at that crossroad. But we need to remember that God laid out our life path before we were even born so he already knows the out come. So in our lives, in that period of time between what we see and the future, is “faith time”. There in lies the delay between our prayer and God’s answer. You should know that that delay (however long it may be) is the period of time where God is preparing your blessing and the answer to your prayer. I recently sold my home and it took 15 Months to sell and believe me it was 15 months of “faith time”. I had to truly wait on the Lord to provide that buyer and put all things together in his appointed time so that I could proceed through the intersection of the crossroads so that the next chapter of my life can begin. In that faith time I learned to have a great deal of patience and I TRULY learned to trust Him in all things. Until later, I’m just tryingtobeamanofgod….